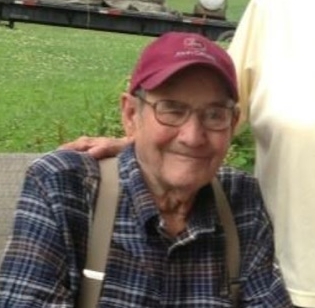 Carl Gardner Fannin, 90, of Emerson, KY, entered into rest at St. Claire Regional Medical Center in Morehead, KY on Sunday, November 11, 2018. He was born May 4, 1928, in Old Trace, Lewis County, KY, a son of the late Russell and Mary Hall Fannin. Mr. Fannin was a life-long member of Old Trace Community Church. Carl was retired from Licking Valley CPA. He also farmed and was known for making sorghum. In addition to his parents, he was preceded in death by five sisters, Helen Fannin (infant), Julie Bell (Ora) Dyer, Opal (Willis) Toller, Becky (Clifford) Carroll, and Sandy Noblit; two brothers, Leotis (Barb) Fannin and Reynold “Toot” Fannin; three brothers-in-law, David Hayes, Kyle “Crow” Gregory, and Mike Tackett; and one daughter-in-law, Nancy Fannin. Carl is survived by his wife of 67 years, Bertie Richmond Fannin; one daughter, Loretta (Jay) Burchett of Old Trace; one son, Donnie Ray Fannin of Vanceburg; four grandchildren, Angie (Earl) Gilliam of Olive Hill, Christopher (Nicole) Fannin of Grahn, Abbie (Kevin) Spencer of Mansfield, OH and Jason Carl (Heather Raleigh) Burchett of Hillsboro; six great-grandchildren, Jacob Gilliam, Hunter Spencer, Jana Fannin, Aaron Spencer, Christopher Fannin Jr. and Natalie Spencer; four sisters, Goldie (Don) Wallace of Grayson, Verna Tackett of Olive Hill, Ann Gregory of Bucyrus, OH and Gladys Hayes of Crestline, OH; and one brother-in-law Gary Noblitt of Bucyrus, OH. Mr. Fannin also leaves behind several nieces, nephews, relatives, close friends and neighbors who will greatly miss him. Funeral services will be conducted at 11:00am, Thursday, November 15, 2018 at the Duvall & Moore Funeral Home with Bro. Monroe Craig, Bro. Bobby Burge and Bro. Kenneth Reynolds officiating. Burial will follow in the Morgan Cemetery, Lewis County, KY.
Friends may call after 6:00pm, Wednesday, November 14, 2018 and 9:00am to 11:00am, Thursday, November 15, 2018 at the Duvall & Moore Funeral Home and Cremation Service, located at 149 Whitt Street, Olive Hill, KY.